1909-11 T206 Piedmont 150 Sherry Magee ("Magie" Error) PSA NM-MT 8 - The Single Finest Example Known! 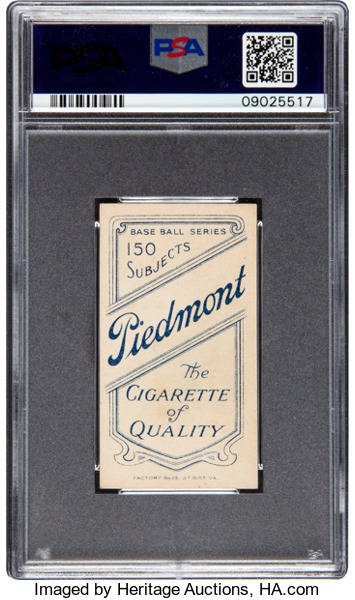 It's the most celebrated "error card" in the baseball trading card hobby, elevating a solid if not gilded practitioner of our national pastime from relative obscurity to a T206 pantheon shared with Cooperstown immortals Honus Wagner and Eddie Plank. While the rarity of those Hall of Fame legends have been commonly ascribed to Wagner's tobacco aversion and Plank's printing plate destruction respectively, this Phillies outfielder earns his position due to a minor editing oversight. Just a small handful of T206's bearing the misspelled "Magie" surname were printed before word got back to the American Tobacco Company that the correct spelling was actually "Magee," the proper format that represents the overwhelming bulk of the print run. So while Magee's Big League career was peaking during the T206 era--claiming two-thirds of National League Triple Crown in 1910 (.331, 123 RBI's), it is that erroneous vowel that elevates the "Magie" to hobby grail status. The full PSA population contains 124 representations of the Magie error at the time of this writing, with all but seven rating VG-EX 4 or below. The air quickly becomes rarefied as we move to the upper half of the ten-point scale, with this spectacular specimen appearing alone at the top. Spelling is the only stumble you'll find here, as the colors are bold, the registration sharp, the centering impressively balanced, and the corners barely touched. 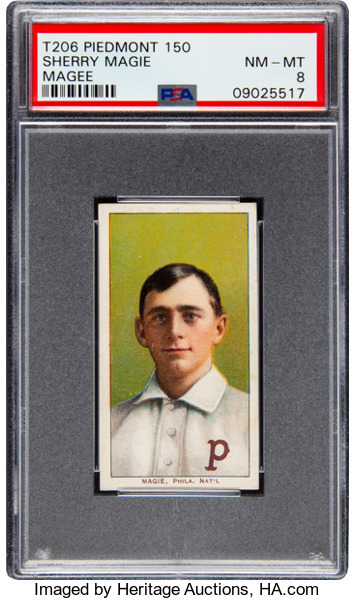 We note that only a single PSA NM-MT 8 example exists for the legendary Honus Wagner and Eddie Plank representations as well, and it's unlikely that either will see hobby daylight again, making this arguably the most unique T206 buying opportunity you'll ever encounter.